R.S. Prussia footed sugar and creamer with pink and blue rose decoration. Both are signed on the bottom with the RS Prussia mark. Condition: the cover to the creamer has a very slight flake, otherwise excellent condition. Creamer is 3 ¾" tall, Sugar bowl is 4 ¾" tall. DUL728. 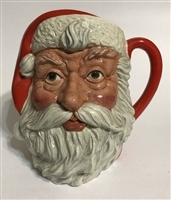 Royal Doulton character jug of Santa Claus. Dated 1983, model number D6704 with a plain red handle. 7 ½” tall, excellent condition. STS730. 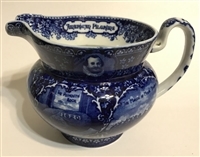 Blue and white Staffordshire ceramic pitcher depicting scenes of the American Pilgrims and Plymouth, Massachusetts. Scenes shown on the pitcher are Plymouth Rock, The March of Myles Standish, The Mayflower in Plymouth Harbor, Pilgrims going to Church, and The Landing of the Pilgrims. Also shown on the handle is the date 1620. Marked on the underneath side “Historical Pottery, Made & Designed in England for L. Straus & sons, New York”. 6” tall, by 9” wide. TAK729. Takito TT Japan porcelain figural decanter of Bonzo the dog. The character “Bonzo” was created in 1922 by comic strip artist George Studdy, and was a popular cartoon character for about 10 years. Marked in red: "Handpaint Made in Japan" and has "T T" in two diamond shapes indicating this piece was made by The Takito Company, Japan (1880-1948). This mark dates the piece to probably the late 1920's to early 1930’s. A rare and wonderful piece! 7 ½” tall. It does have one minor flake to the collar; Otherwise it is in excellent condition. Bisque piano baby laying on his back with the legs up and resting on a flowered pillow. The piano baby is in excellent condition, unsigned. 9 ½" long, 5 ¾" tall. Bisque bottle of a small child holding a baby bottle. The head is the removable cover to the bottle. Unsigned, but a very unique piece. Excellent condition, 8" tall.